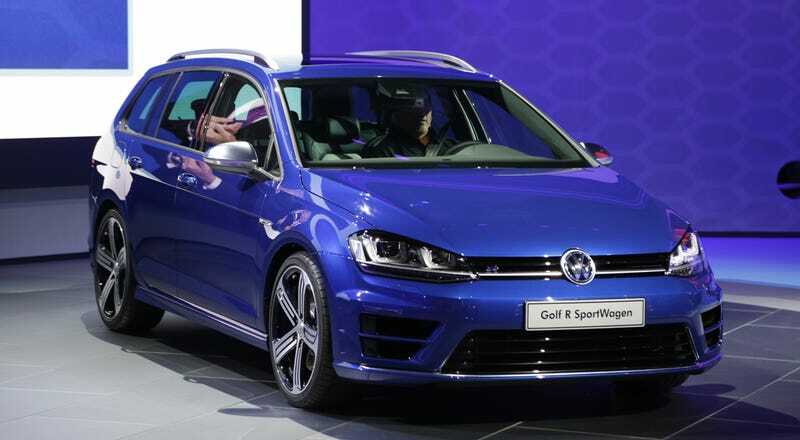 I have seen the 2015 Volkswagen Golf R SportWagen. It is real. It is beautiful. It is powerful and wagontacular. And it may never be ours, my fellow Americans. For all our talk of freedom and high standards of living and wonderful inventions like frozen yogurt, there is a good chance we will never have this. "A 300 horsepower sports car with all kinds of space for everyday living!" Dr. Heinz-Jakob Neusser joyously exclaimed as he unveiled it at the LA Auto Show. It's not really a sports car, but who cares? I was there when he said all that. We wanted to believe him. He was like a stage magician and we were his audience, rapt with attention, caught up in the wonder of the moment. Like two teenagers fumbling around in the dark for the first time, our bodies tingled with excitement at the sight of the stunning blue wagon. A turbocharged 2.0-liter engine with nearly 300 horses. All-wheel drive. Room for all your stuff. Zero to 62 mph in just 5.1 seconds. We hung on Neusser's every word, because we didn't just want the Golf R SportWagen — we needed it. And why can't we have it? We're getting the Golf R hatchback. They priced it at a smidge below $37,000 and everything. We're getting the Golf wagon too. Why not both? Why? Why? It represented hope for us. Hope that things could be better. Hope that the dark days of our past were over. Happy days are here again!, we all thought. Maybe we can leave a better world for our children after all, if we can just have that Golf R SportWagen. Things haven't been right in this country for a long time. I know that. You know that too. Most people know that, even if they can't admit it or even bring themselves to realize it. But they feel it every day. Right there, on stage behind the effervescent head of powertrain development, was our answer. Golf. R. Sport. Wagen. Volkswagen currently has no definitive plans to sell it in America.